One Pretty Little Box: A good NSV for the week! A good NSV for the week! 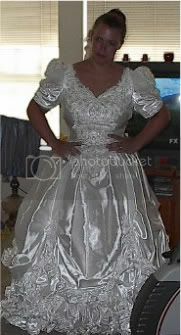 My wedding dress fits! My dh and I got married May 19, 1995, and who knew?! In all reality, it was a bit bigger on me then on my wedding day! One more NSV (Non Scale Victory), on this same day my mother actually told me "I am proud of you!". That was the first that was said, besides "dont' lose anymore"! It was a good day! Yay! How cool is that! Way to go Sheila! Good to see you so well! CAn't believe you are blessed to have a "teachers" conference Christian style!!! Such a blessing! How amazing is He?!! !